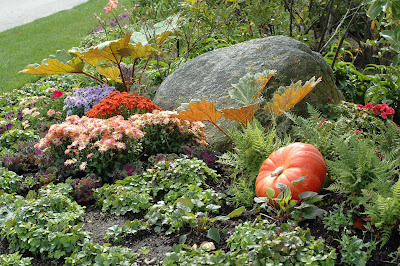 When you head out to buy your pumpkins to decorate the garden for the fall season, look for pumpkins that have interesting color and form. Don’t look for the standards ones that you can find everywhere. Seek out the interesting pumpkins or at least mix them up a bit. There is an extensive collection of unusual heirloom varieties, many of which are exceptional for cooking. Some of them may be a bit expensive but the flavor is wonderful. Don’t let them freeze on the front steps with a hard frost. Find a good recipe. There are many for pies, breads, soups or bisques. For example, one of the prettier pumpkins for decorating and also for eating is a Cinderella Pumpkin. Its intense red-orange color stands out for a seasonal display but it also has a thick, non-stringy flesh with very sweet flavor. Sorry if the inspirational gardening thought of the day sounds a bit sexist, but I absolutely love it. “Men are like pumpkins. It seems like all the good ones are either taken or they've had everything scraped out of their heads with a spoon.” (Unknown author) Go forth and find your pumpkin. Pick the good ones before they are gone!